The US's richest tycoons increased their personal wealth in the past year, with the top 400 worth $1.13 trillion (£640bn), says Forbes magazine. 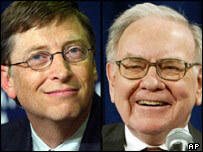 Microsoft boss Bill Gates kept top spot for a 12th year, and widened the gap on investment guru Warren Buffett. Paul Allen, a Microsoft co-founder with Gates was third, followed by computer group founder Michael Dell and Larry Ellison, head of Oracle software. The other five names in the top 10 came from the Wal-Mart owning Walton family. The biggest gainers were the founders of search engine Google, who floated their company on the stock market this year. To make this year's list of the top 400 fortunes in the US a minimum net worth of $900m was required - up from $750m last year. The top rankings were little changed over the past year, however the net worth of the 400 rose a combined $125m. Forbes said Mr Gates's financial strategy was that he "diversifies methodically, selling 20 million shares every quarter, reinvesting through Cascade Investment". As well as his vast Microsoft stockholding he has "big stakes" in Canadian National Railway, Republic Services, and interestingly Berkshire Hathaway - which is controlled by Mr Buffett. Legendary investor Warren Buffett runs the Omaha-based holding group Berkshire Hathaway. Famous for his long-term investments in what Mr Buffett identifies as undervalued companies, the so-called "sage of Omaha" has delivered decades of above average returns to his shareholders and himself. Microsoft chief executive Steve Ballmer was ranked 11th, and search engine Google's co-founders Sergey Brin and Larry Page jumped to share number 16 as their fortunes doubled. Among those falling off the list this year was Dreamworks co-founder Jeffrey Katzenberg. The only UK-based American in the list, is Louis Bacon, who founded Wall Street-based investment group Moore Capital. Mr Bacon lives in London and comes in at 346th place with a net worth of $1bn (£558m). Polish-born Barbara Piasecka Johnson is the top ranking American living in Europe. With a personal fortune of $2.3bn (£1.6bn) - thanks to her inheritance - the Monte Carlo-based billionaire takes 78th place. Australian-born media tycoon Rupert Murdoch is in 32nd place, down from 27th place last year. He became a US citizen in the 1980s, a move that allowed him to buy US television stations.